Do you believe in ghosts? I'm still undecided, even after a "ghost" encounter the summer I was 17. I was spirited away to a friend-of-a-friend's house to experiment with the supernatural. We performed our séance at her parent's house, a cozy traditional two story trick house on its own isolated lot of shady pine trees. My best friend Marianne, her cousin Krizia, the new-to-me Clairvoyant girl (we'll call her "Alice") and I gathered in the den and evoked the ceremony. The OUIJA board was set out, in place of the included "planchette" to spell the words we used the a heavy down-turned drinking glass. Alice said an incantation resembling a prayer to "keep us safe", then the four of us gently placed only the very tips of our middle and pointer fingers of both hands on the glass and waited. Alice asked if anyone was there. "She" spoke. This glass glided effortlessly across the board, answering our questions about her life. My skeptic brain still needed proof. I asked it questions no one there would know: what was I thinking, what was I doing that morning, where were my parents born? Each answer was spelled out with perfect accuracy. I wasn't moving the glass and it would have taken some magic skill to make the heavy glass glide like it was, so what did it? Initially enchanted, Marianne and I borrowed the board and tried it at my house but we never got it to "speak" again. I started to research, Science-minded friends and individuals reported it could have been a physic movement or unknown-to-us involuntary movement. The closest scientific explanation is the "Ideomotor Effect" which claims the Ouija Board works by causing users to reflexively respond to the questions without being aware that they're moving, but I don't completely buy it. If I was the one moving it (and I'd have to be, because no one else there knew answers to those questions) how the hell did I move a very heavy glass without knowing it? I've tried to move a similar heavy down turned drinking glass by barely touching it with four finger tips and it doesn't work. Curious and curiouser. The OUIJA whimsy stopped when stories, testimonials, and friends introduced the possibility that it wasn't benevolent spirits we contacted but malevolent demons posing as kind ghosts, waiting to strike. I was raised Roman Catholic, I'm not religious anymore but just typing that gives me chills. There are certain beliefs you just can't shake being creeped-out by, Science-Be-Damned. The Ouija Board was promptly removed from the house and I've never allowed one into my residence since. I would not feel comfortable alone at night in a house with a Ouija Board. Nope. No! I've had a lifelong fascination with the horror genre and the occult, I steer clear of anything crazy for the most part but now I'm feeling morbidly curious again. I think I may find another Ouija Board and explore some haunted places like a fool. If posts suddenly stop this October...I guess I'll be with you in "spirit"! So gather round the campfire my friend and tell me your ghost story. Thrift or non-thrift related, I wanna know! When I went to the CIA, it was rumored that the school was haunted. It was a former Jesuit monastery, with a graveyard on campus, secret catacombs running beneath the school, we even at our meals in the former chapel. Our dorm building seemed to have something weird going on with it too. My friend and I would approach the front doors at night, and without even pulling out our key card, the doors would click unlocked as we neared them, and no one was ever around. Then once as I was alone in my room during the day, I took the trash out. The doors locked behind you after your shut them. I slammed my door, headed out, and when I came back, unlocked the door and walked in, the shower was running. I thought maybe my roommate had gotten sick, returned from class early, and was showering, so I just ignored it. After about 20-30 minutes though, I got a little worried and started knocking at the bathroom door, harder and harder, with no answer. So finally I opened the door and the shower was on full blast, shower curtain open, spraying out into the bathroom. No one was there though. The floor had a few inches of water on it, but I ran in and turned it off. I then proceeded to hightail it out of my room and ran to a different building to my friend's room! The steakhouse in Dallas I used to work at was rumored to be haunted as well. It was actually a morgue in its former life (appetizing, isn't it? ), and Kennedy's body was allegedly held there shortly after he was killed. A few waitresses who ended up staying late at night claimed to have seen and heard things, and when I would arrive to the kitchen in the early morning before everyone else, sometimes lights and equipment would turn off and on when no one was around. I'm not a real big believer in ghosts, but evil spirits(demons), I do believe it. So it kind of freaked me out. No haunted thrifted finds yet! And I refuse to ever touch a Ouija board. Those things scare the crud out of me. Ok-- when I was expecting, my sister found my old baby blanket on the floor of my dad's bedroom closet. Just laying there. Apparently in had been on an upper shelf, unbeknownst to her or me. I had no idea it was even around anymore. It must have been toward the bottom of a stack of blankets and pillows. How could it fall out? By the way, my mom was gone by then. Rather creepy. I did use it now and then after my daughter was born. I got the impression someone wanted me too. Aw, kind of sweet. And creepy! Oops-- that should be "to" on the last sentence. Sorry! No problem, didn't eve notice that the first time! Well, yes, I do. You know the scenario, teenaged girls, late at night, with a ouija board. We pestered the thing with tons of questions, it had gruesome answers (one of which was how it had died, by hanging, and turned out a neighbor had committed suicide by hanging some years before). After a while it must have tired of us, and began spelling out "hahahahahahaha". We screamed and I've never touched a ouija board again. Yeaaah I would scream and never touch a ouija board again either, thank whatever mystical forces that our experience didn't turn scary. I did forget to include the fact that I kept mine in my bedroom for a little bit before just looking at it started to freak me out so much that I exorcised it from the area. Our "ghost" claimed to have died in a motorcycle accident. I love ouija boards and things made to look like them. My otherworld experiences have involved muffled voices and heavy footsteps upstairs in the barn loft when I know no one else was there. Why don't spirits tread lightly? I love how they look too. Too bad one ain't allowed in my house ;) In all honestly I'm looking for one right now to resume experimentation. Oh, and the barn story, freaky! I've never "heard" the supernatural. I have no idea what I'd do if I saw a figure, shrink back eyes wide and unable to squeak out a word I'm sure. This year we're going to explore the United State's oldest city (and my favorite!) St. Augustine 45 minutes South and take one of their "hearse tours" of all the haunted spots. :D Supposedly a lot of them but I've explored around at night and never seen/felt anything. Mine is pretty simple. My Dad's birthday is April 1. I was lying in bed reading, looked over at the clock, and saw that it was just past midnight. It was my Dad's first birthday since he'd passed away the previous year. I whispered, "Happy Birthday, Daddy." No more than 5 seconds passed before I heard a loud thump. I got out of bed and looked around, but I couldn't find what made the noise. The next morning I discovered that some stuff had fallen over in the linen closet - stuff that had been in place for days. So yeah, I believe my Daddy heard me and answered the only way he could. Aw, thanks for sharing Christine. I remember every sleepover I went to as a child/teen involved a séance. And every one had a particular girl who had a "true" story about doing a séance and the body was flying around and blood was squirting everywhere and eyeballs were floating around and its all true etc etc...Every party had that one girl who had some "true story". Blah blah blah. And whatever girl had some "true story" that she had to share....well when that girl went to bed, we'd dip her hand in water and try to get her to pee herself. Yea, Im kinda a skeptic. Im not saying stuff doesn't happen, but definitely not these glorified horror stories that someone always had to share at parties. My skeptic and believer sides do battle like a inner Mulder/Scully dialog. Hell, even experiencing hasn't fully converted me. There's a rational explanation for almost everything, but being raised Catholic with Hispanic superstitions was potent indoctrination. I'll never be a full-on skeptic. Thanks Hayley! I don't believe in the mystic power of Parker Brother's toy, haha, but I do believe it's possible it can be used as a communication tool. I think we could have drawn the alphabet and "yes" or "no" on the floor with chalk and something physic or supernatural could have happened. I have never tried a Ouija board and never will. I did pick up an older one at GW but after some thinking, I put it back on the shelf because I didnt want on in my house. I have had a couple of weird experiences. One of my friends from high school died in a car accident. I did not attend her services and later that night I saw her in my doorway wearing a light yellow flowered dress. She passed through the door, waved at me and went into my bedroom. I was sitting on a couch. Totally freaked out. The next day I told my sister about this and she said she was buried in a light yellow flowered dress. Thanks so much for sharing the stories, I can see why you wouldn't want a Ouija board in your house! Aaand yep, that's pretty damn creepy, too. That was the only time a Ouija board has ever worked, and not once since. Reading about it more did discourage me from messing with one again for years, though! I have to say that if ghosts wanted to contact someone, do you think it would be through a toy at a girls slumber party? Is that really the best outlet? Im not saying ghosts are not real, Im saying that the Ouija board or a séance at 12 year old girls slumber party aint where its at! I don't think it's the Ouija itself having power or anything for sure, I think in my case it really was some strong case of "ideomotor affect", that I really did move the heavy glass with my finger tips without realizing it subconsciously and that the human body is actually scarier and weirder than we know, or that the girl at the party, "Alice" was a medium and we could have contacted a spirit using a rock and stuff written on chalk on the floor or anything else. For me there's a kernel of possibility from shared experience, but I am a skeptical person. If an experiment can't be replicated your theory isn't sound. I want to try again. Of course anything that happens at a 12-year-old's slumber party should be taken with a grain of salt. Our experience happened once when I was 17 for an hour or two with three friends and stranger, wasn't the same giggly type of experience. I'm absolutely terrified by ghosts and demons. I guess that latin/catholic/pseudo santeria stuff that my family taught me scarred me for life too. LOL The thing is my best friend is like some kind of medium, she doesn't accept it because she is also a little bit terrified by weird stuff, but she is always the one that "feels a presence" or something. She's always telling me stories about things she sees when she visits friends and relatives and apparently her "gift" runs in the family. I believe what she tells me because I've known her for a long time and this has always been there, but I've never (knock on wood) actually seen anything weird. My ghost story started when she decided to buy a Ouija board. We were around 18-19 if I'm not mistaken, and by then 3 boys from our senior class at High School had died. The first death was around the beginning of the school year, the boy had some kind of stroke and died in a basketball court. The second was a boy that was diagnosed with cancer shortly after the first death and died a few months later. The third one happened after graduation, this boy was loved by many as he was pretty popular, an awesome friend and kind with everybody, he died in a motorcycle accident while talking to his girlfriend on the phone. My friend had been using the Ouija board with her boyfriend and she claimed that the second boy talked to her. I was pretty skeptical and scared, but very curious to see what all the noise was about, so we had our séance. We talked to "him" and asked all the questions for which he had all the answers. The interesting part of the story comes when he asked us for help... He told us that he wanted us to talk to his mother and he gave us a phone number to call her at. That obviously didn't work because the number was not in service etc. So then he asked us to contact a mutual friend and told us that she was in trouble and she needed help, with cigarettes... I decided that I would contact her and help her, because after all she was my friend too. When I told her everything including stuff about the Ouija board, she cried a little and told me that he was right, that after he died she had been smoking a lot and that she was not surprised about what I was telling her, because she had "felt his presence" before. She told me some creepy stuff that started happening to her after he died and with her anecdotes and some stuff that "he" told me about I concluded that he was in love with her when he died. After this happened my best friend and I could never "contact" him again. The superstitious latin upbringing will do that to you! I never keep catholic imagery in my house, I feel like the eyes of the Saints, Mary or Jesus are following me whenever I walk around the room, scares the hell out of me. Thanks for sharing the story, so creepy in many ways! One of my cousins told me about a spirit that lived in a house she shared with friends. The spirit was friendly and seemed to enjoy the people living there but did not care for one person and would be mischievous with his possessions, hiding them, knocking them over, etc. Nothing evil. Since it is so difficult to determine if spirits are real or not, I try not to think about them and would be frightened to be anywhere where they might be. I will not watch spooky shows since my imagination could go ballistic with such fodder. Since I cannot prove the existence of spirits, I cannot disprove them, which is unsettling. I can't for the life of me understand movies where people push the envelope and just want to go to the basement, or open the closet...or whatever! Me? I would be out of that house so fast, you would only feel my wind. I am beginning to believe that spirits are reincarnated over and over...why would we be unique each time? Since I believe in recycling, why not our spirits? I guess since I don't like cruel, nasty people, I have no desire to take my chances meeting up with a malevolent spirit. I appreciate the graphics of a Ouija board but I guess I would not want one in my home. Haha, I'm that annoying person that always shouts at the screen, "The hell are you doing, you fool!" when people investigate moving chairs and obvious spooky/dangerous stuff. I have an overactive imagination and try not to watch very scary movies when I'm home alone, only the not-so-scary/bad/or kitschy ones. I'm the same way, if something malevolent and unexplained appeared I'd be GONE fast. Oh yes, the lights being kept off is a big one, WHY would anyone do that. This really bothered me int he first "Paranormal Activity". If I was being terrorized by a demon ALL the lights in that house would be ON! Really enjoying this thread BTW......nice one, Van! Glad you're enjoying it! :) Knew I couldn't be alone here! I can say a WHOLE LOT on this topic, but I will keep it brief. My very best friend (who's originally from Jacksonville) has a very strong psychic ability, and she has encountered a whole lot of strange things. She was also a foster child who witnessed a lot of evil. But her whole life, ever since she was a little girl, she has always felt a spiritual, protective presence in her life. There was a really famous incident/tragedy that occurred in San Francisco several decades ago (before I knew her) in which she was inside a law office when a disgruntled gunman suddenly showed up and started shooting. She didn't realize what was happening because just before the gunman showed up, she got a pounding headache and had to leave. She got onto one of the elevators and while she was going down, the gunman was making his way up the building and had started shooting. When she got to the ground floor, the security guards were surprised to see her come out of the elevator because unbeknownst to her, they had stopped all the elevators in an attempt to slow down the gunman. Well, my friend didn't know what was happening until she got home and turned on the TV set and saw the building she worked in on the news. That's when she realized what had happened. As it turns out, she later found out that one of the lawyers she knew who was the best friend of her boss, was killed in the rampage while trying to protect his wife who also worked in the building. This tragedy helped spearhead the anti-gun movement in California. Anyway my best friend relayed a story to me that when she was little, word went around her neighborhood that a bunch of kids who had been playing with a ouija board had all died afterwards. Her family sent her up to the attic to retrieve theirs to get rid of it. My personal feelings about ouija boards and seances - I avoid them because I think you're asking for trouble conjuring up spirits, and you don't know what kind of spirits you're messing with. I am very suspicious of ouija boards because I have heard enough horror stories about people playing with them to know that they are not meant for good. Regarding the whole "ideomotor effect" - I don't buy it. I have yet to hear of a scientific study proving that that is what is going on when you're playing with a ouija board. That's interesting, I've met another former foster child who said she has strong psychic ability that's from here. She'd get bad feelings before bad events, too. Thanks for sharing your story! Girl, We just dropped one off at the booth! Got get it!! Will check it out :D ! I do not believe in ghosts. If something wants.to change my mind, I welcome it. I've luckily never worked in a "haunted" spot or lived anywhere "haunted". I've had several experiences. One late evening I was out with my mom and dad. Our church was in a rural area and daddy was worried about pipes freezing so stopped by the church to turn the faucets on to leak a bit. As Daddy went up the steps a large glowing ORB came around the church and stopped at the steps, then it disappeared. The graves and such for that church were quite old, much older than the early 1900's church and the church had been built on the site of the former building. There were a couple of other things. The kids tell me that 'The Man' used to sit on their beds at night and tell them stories (shudders there. It's one thing to deal with ghost yourself another to think of him chatting up the kids, lol). Mind you they were never afraid of him. I know who the ghost was as they called him by name as they got a little older, 'Mr. Harold'. Guess what the murdered man's name was? I'm not entirely convinced that I've been "haunted" by any single item I've brought home from the thrift or flea market, but wouldn't be shocked if I was someday. Although I will say that I knowingly purchased a very creepy doll for my collection of found vintage oddities. Lately, though... I've had a very uncomfortable feeling around that doll specifically. Nothing has happened directly, no movement or anything dramatic. But there's been a few late nights of me working on the laptop in my bedroom where I had happen to glance in the full-length mirror attached to the closet door. The doll is seated with a few others from my collection on a child's size chair across from the mirror. And for some strange reason, in the mirror's reflection there was a strange fuzzy haze over the doll's face. It was late. I was getting rather tired and had been working on my laptop, mind you. All perfectly explainable reasons for a lapse in otherwise fine vision (corrected by contact lenses). But it's happened a few times now, regardless of the hour of the day or working on the computer. A cloudy haze over the doll's face and just an explicable feeling of... dread. I'm not sure what it means or why it suddenly started some two months after me purchasing the doll and why it happens every so often. Haunted? I don't know... I guess it's possible! Most dolls creep me out, wouldn't want to be in a room alone with them whether it's haunted or not! My boyfriend's mom has a huge collection of dolls all over nearly every square inch of her home. The first time I saw them they weren't scary. Then we watched "Wake Wood" at my house (AWESOME movie) then went back to his house and it was like ALL of those glassy eyes were on me following me everywhere, freaky!!! I know it was my imagination but it was scary, I didn't even want to go to the bathroom alone. Ooh, what a fun post! I lived in a very haunted Civil War -era house when I was young. I used to see a floating apparation next to my closet at night. Often when someone was home alone, all the bedroom doors on the second floor would slam, one by one. And the door to the staircase to the attic was always open when we woke up in the morning, even though it was closed at night. It was super creepy at first, but there was definitely a feeling that the ghost(s) were "benevolent" and not angry, so over time we just got used to it. And yes, I did the Ouija board thing in that house with some friends once, and YES it moved -- definitely on its own. That freaked me out more than anything else that ever happened there! THAT would freak me the hell out, I had an active enough imagination and had trouble sleeping every night as a child (too many horror flicks) without actually seeing anything! 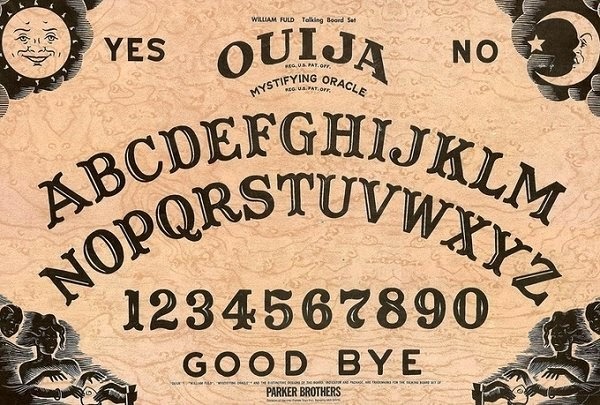 Though I've never actually had a successful Ouija experience, the once time my older sister chided me to try on an old Ouija board we had in my closet. My mother stopped us before we could start/finish the session and ever since, I've had a kinetic energy and strange things have happened to me and I've been able to see something like a spirit ever so often, it could've been a flash of white at the corner of my vision or a black I see before I turn my head, but I saw them. Then my older sister started to have terrible luck and my luck was tremendous. Then I would start thinking things, like once, I had set my glasses down on the table a few feet away from me because I had just cleaned them and a few minutes later I thought that I should probably get my glasses and I swear, they lifted into my outstretched hand. But, no one would believe me. But experiences like like and something like dreams of the future happened and what I believe is that my older sister had conjured a spirit of sorts and my mother took the board and the spirit latched onto my older sister and she pulled bad energy to herself, while I guess, something like unlocking my spiritual energy happened. Even at this moment, I can feel a spirit behind me. Creepy stuff.